Here is another story to file under sounds quite mad, but has just been confirmed as true by a movie studio. The reason why Russell T. Davis stopped doing Dr. Who for the BBC, was so that he could go away and re-do it in America as a film with a big movie studio. Yes, my US publisher Tor has just got a confirmation on this very strange story from their own sources in Hollywood. This story first popped up over at pubarticles.com – and someone cared enough about it to serve a takedown notice on the website and the story which originally appeared here, moved to here, before being deleted in its entirety. When – if – this new Dr. Who movie does get made I just hope that they make a better fist of it than the original Dr. Who movie. Although it has to be said, many of the elements that put off us fans from the film, such as the doctor getting all jiggy with his assistant, we’ve now been inoculated to, by years of simmering romantic plot lines between the new doctors and his many assistants under Russell T. Davies’s reign. Here’s a snippet from the original PubArticle piece. Given that the confirmation from Tor’s sources was a little vague on the actual nature of where Depp was going to be deployed, I can’t help but wonder if he might actually be appearing as the Doctor in the forthcoming American Torchwood re-boot, rather than in a stand-alone USA-made Doctor Who movie? I meant when Paul McGann played the eighth incarnation of the Doctor in the 1996 Doctor Who movie. I would agree with you, the early Peter Cushing movies were quite good. I was excited about the prospect until they said that the Daleks would make an appearance. I’m a Doctor Who fan, but I find that every new episode that ends in a “surprise, it’s the Daleks” leaves me cold. They were a surprise to me in the first couple Davies seasons, but after I just found it sort of bland and lazy. We need a bad guy; let’s get the Daleks again…and have the Doctor still be surprised by their appearance…It’s just…expected. I just feel like they could do something bigger. I get that the Daleks are the Doctor’s worst enemies, but the stories feel oversaturated with them now. We need a new enemy…something the Doctor doesn’t know about, something dangerous, and something that even the Doctor is terrified of…that would make for an amazing movie. And I can see Depp as the Doctor. He could pull that off. Sadly I think Paul McGann was really an ideal actor to play the Doctor, but the script was a complete mess. I think that Richard Grant, who appeared with Mcgann in ‘Withnail and I’ would make a good Doctor as well. As an American fan of Doctor Who since the Days of Tom Baker, I feel that justice demands a chance at redemption for the fiasco that was the ’96 McGann incarnation. Nothing against McGann, Mind you, he really had nothing to work with. I trust Depp’s sensibilities in picking film projects. It’s a really good omen for the quality of any film that he chooses to involve himself in. He’s had a couple misses, but anyone who could pull off “Edward Scissor Hands” is a force to be reckoned with. 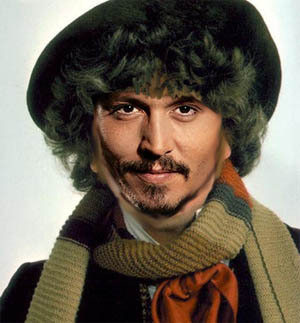 Besides, even if I had only seen “Pirates of the Caribbean”, I would think Depp was a natural choice to play The Doctor. Here’s hoping! I have to agree with SMD. I too am getting very bored with The Doctor meeting the Daleks in every series of the new adventures. They only used to turn up occasionally in the original series and it was a real treat. Now they’re just not as threatening. It was good to see the Silurians in the last series and the Sontarans in the last Tennant series but Please leave the Daleks to have a rest for another couple of series now. Depp as The Doctor could work well. He is a superb character actor, but please no cod English accent like in From Hell et al. Finnally I would like to say I felt Matt Smith was a great choice as The Doctor. Bought back much of the quirkiness of Troughton, Pertwee and Baker and got us back to the real Doctor after the Tennant days. I did like David but his Doctor was getting a bit dull. Hope the Christmas episode and the next series continue to develop the odd-ness of The Doctor and come up with some good, scary foes for the last timelord to contend with. I’m a big fan of Doctor Who, but Johnny Depp as the Doctor??? I won’t be wasting my money on that! It won’t hurt to miss one story.